We are storytellers by nature, and theatre has existed in one form or another since before recorded history began. A degree in theatre arts will prepare you for performances and technical productions in live theatre, film, television, and multimedia. The program is designed to engage you with the art and craft of theatre by providing ample and varied opportunities for the study of theatre literature, history, and dramatic theory—all while emphasizing a practical application of theatre knowledge through production. Gain an understanding of the origins of the theatrical arts, theatre's subsequent history of performance, the dramatic literature and dramatic theory upon which theatre is based, and the influence of theatre upon societies throughout the world. Crucial to your success is understanding the nature of aesthetic perception—the ability to communicate aesthetics through artistic expression. This will be honed through your extensive experience of bringing productions to life. 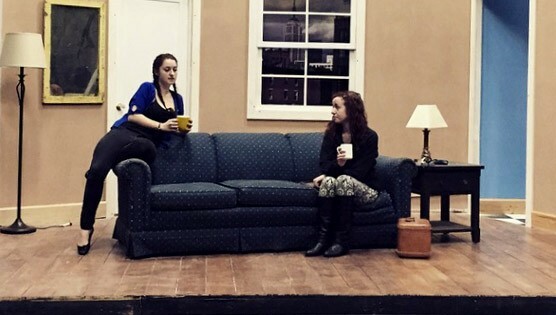 Our students have brought home top regional awards from the Kennedy Center / American College Theatre Festival. Not only do Cal Lutheran students shine onstage, they're also busy behind the scenes, taking positions of responsibility with publicity and sound, light, makeup, scene, and costume design. The campus' close proximity to Los Angeles provides an arena for you to explore a variety of screen, stage, television, and musical presentations and connections with industry professionals. During the summer, take advantage of student internship opportunities in Camp Shakespeare and the Kingsmen Shakespeare Festival, a professional theatre company that performs on campus. We don't just focus on warm-ups and how to speak on stage. We also study the history of theatre, and we are encouraged to broaden our intellect by taking classes outside of theatre. This helps us become more knowledgeable when we are faced with challenging roles and situations. When students are able to assist me in the costume design process for television commercials or for the stage, it best prepares them for a career in the industry by giving them real world, relatable experiences. They are able to creatively problem solve and to quickly think on their feet. As their teacher, my goal in the classroom is to give students as many tools and opportunities as possible to equip them for situations whether creative or practical. Many graduates have achieved careers in the competitive world of professional theatre, film, and television. Graduates have also been accepted into graduate theatre programs at universities throughout the United States. The theatre arts curriculum also provides practical performance, management, communication, and work skills that relate to many other career fields—making for a versatile degree.